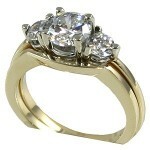 2.5ctw - 1.25 ct center 2- 1/2 ct side stones. Price is for the complete set wedding band included! Available in other carat weights by special order.